A seismic performance assessment of historical Kütahya Kurşunlu Mosque in Turkey is presented before and after it has been retrofitted. Site investigations were carried out to identify structural conditions, in which severe cracks, especially on the dome, were mapped. Regarding damage conditions, the Mosque has undergone several interventions, including retrofitting actions, in order to improve its seismic performance and global structural behavior. Effectiveness of seismic retrofitting of the Mosque was investigated by using the finite element method. Two representative structural models of the Mosque, namely non-retrofitted and retrofitted, were generated as a three-dimensional finite element model using an advanced structural analysis software. Ambient vibration measurements were performed to identify modal properties of the Mosque. Thus, the finite element model was calibrated and improved according to the experimental modal data. Nonlinear pushover and dynamic analyses were conducted to evaluate the seismic performance of the historical Mosque. This paper aims to demonstrate the effectiveness of the adopted retrofitting by comparing the models (before and after retrofitting) and, also, to validate the nonlinear behavior of the model by comparing it with the existing damage on the Mosque. 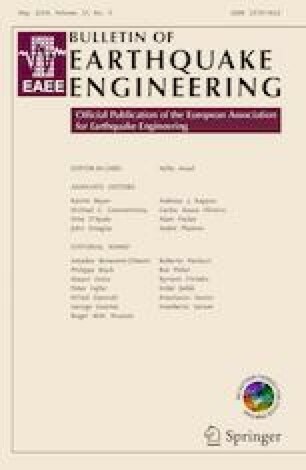 The authors thank Dr. Onur Kaplan, research assistant at Eskişehir Technical University, for his experimental campaign for the ambient vibration measurements of the Kütahya Kurşunlu Mosque and Georgios Karanikoloudis, PhD student at University of Minho, for the knowledge shared to perform operational modal analysis.